The key to successfully treating natural stone stains is cleaning up any spills and treating any resulting stains as soon as you can. The best way to remove a stain on stone or other porous hard surfaces is with a poultice. A poultice is simply a mixture of a chemical or cleaning agent to break down the stain and an absorbent material to draw the stain out of the pores of the stone. You can purchase convenient ready-made poultices or create your own. Before you attempt to remove a stain, be aware that a stain is a discoloration, but not all discolorations are stains. As mentioned above, a poultice is the combination of a very absorbent medium (it must be more absorbent than the stone) mixed with a chemical, which is to be selected in accordance with the type of stain to be removed. The concept is to re-absorb the stain out of the stone. The chemical will attack the stain inside the stone, and the absorbent agent will pull them both out together. The absorbent agent can be the same all the time, regardless of the nature of the stain to be removed, but the chemical will be different—in accordance with the nature of the staining agent—since it will have to interact with it. To find out what chemical to use on your stain, see our Stain App. 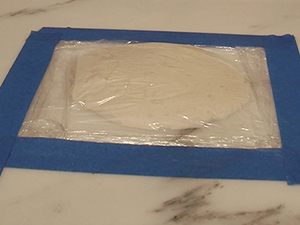 This video, produced by SurpHaces, features Fred Hueston, Chief Technical Director of Stone & Tile PROS, at The Stone and Tile School demonstrating how to mix and apply a poultice for removing a stain from natural stone. Please feel free to contact us with any questions you may have about removing a stain from your natural stone. This is one of a series of articles written and published on behalf of SurpHaces PRO Partners. Did a great job from start to finish! Blain is very professional!